FILE - African Union Mission in Somalia (AMISOM) soldiers from Burundi patrol on the outskirts of Mogadishu, Somalia, May 22, 2012. The five East African nations contributing troops to the AMISOM peacekeeping mission in Somalia have called on the U.N. Security Council to keep troops slated for removal by 2020. The withdrawal of the more than 20,000 AMISOM peacekeepers from Uganda, Kenya, Burundi, Ethiopia and Djibouti is slated to begin this year. Heads of state from the five countries met with Somalia's president and regional officials in Kampala on Friday. The countries reaffirmed their commitment to continue to assist the federal government of Somalia in its stabilization effort, but they warned that the planned AMISOM drawdown would endanger hard-fought gains made since the force deployed to Somalia in 2007. More than 80 percent of the country's territory has been recovered by the Somalia National Army and AMISOM, but the political and security situation in Somalia remains fragile. In a communique read by Uganda's foreign minister, Sam Kutesa, the heads of state said the main thrust of U.S. Security Council Resolution 2372 of Aug. 30, 2017, "was a phased reduction and drawdown of AMISOM troops by 2020." The leaders said the time frames and troop levels under the resolution were "not realistic and would lead to a reversal of the gains made by AMISOM." One of the main issues of concern for the troop-contributing countries has been the inadequate funding of AMISOM, which was the basis for the call last year to draw down troops. FILE - Somali women react at the scene of a deadly blast in Mogadishu, Somalia, Oct. 15, 2017. Somali President Mohamed Abdullahi Mohamed has pledged to rebuild the national army. "But I believe we have a long way to go," he said. "We need to put together a sound strategy in order to effectively fight against al-Shabab and defeat them. If we continue to collaborate with the help of the [European Union] and international community to continue funding this operation, we will be able to defeat al-Shabab in a very short order." 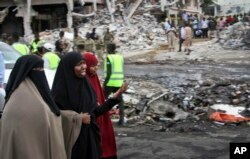 Al-Shabab militants continue to carry out frequent attacks. The group carried out Somalia's deadliest terror attack ever in October of last year — a truck bombing in Mogadishu that killed more than 300 people. However, the regional leaders meeting in Uganda stressed that threats in Somalia also stem from other armed groups and from communal infighting. "There is no doubt that we need to continue sustained military operations," said Moussa Faki Mahamat, president of the African Union Commission. "Most importantly, we must also address in a comprehensive manner the causes of radicalization, continued recruitment and localized grievances and conflicts." Emphasis was also put on the need to provide more than 5.4 million people in Somalia with lifesaving humanitarian assistance.